Agile is one of these magical words in our days. It’s like a promise that by using an “agile method” everything will be faster, cheaper and definitely more innovative. The project managers that I heard talking about Agile made it always sound like paradise: everybody is working together, the process is very flexible, the client is involved and part of the game, it’s like a big game show and everybody is invited to play. The result will be an amazing product that everybody loves – because of the very flexible and dynamic process. And I share parts of that vision. Having iterations, coming together regularly to share work in progress, give and get feedback – that’s great! The agile approach offers a new way of planning a project by splitting it into smaller pieces. The agile approach to me is first and foremost about collaboration instead of working in silos, which also allows more flexibility instead of following fixed phases. All in all agile to me is a mindset rather than a methodology. A lot of methods and “tools” are not really new to the development process – but it helps to start a new way of thinking. Even though we all like to be proud of our “work results”, we want to feel some kind of “ownership” of our deliverables – which could be wireframes, design comps or code – in a project team we should start to get a more holistic view and understand that it is all about the final product that we are all contributing to – and not about a single deliverable. 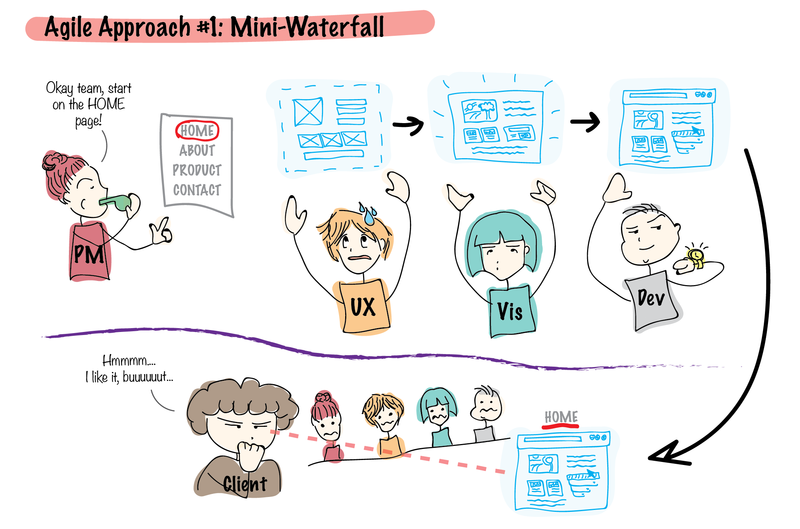 What does Agile mean for UX? A different way of organizing projects, a collaborative working style and a specific mindset – what impact does it have on my way of working? 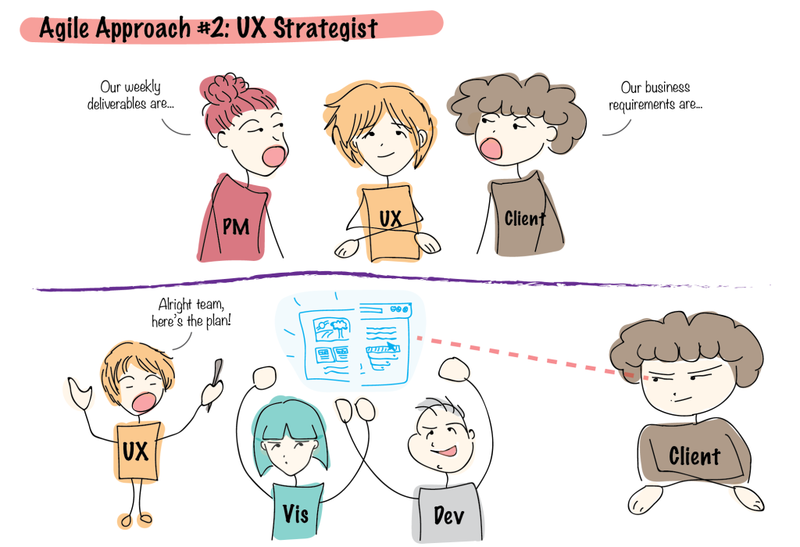 How does it effect my role as a UX designer? 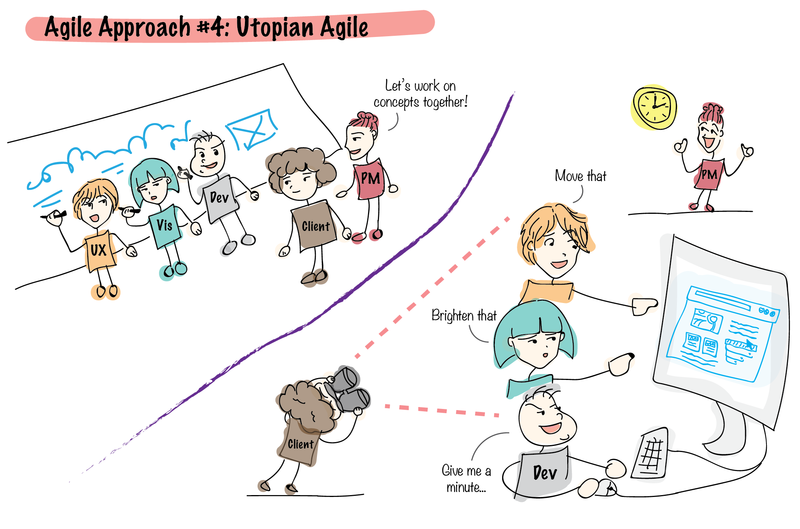 I was having an interesting conversation with my colleague, Harjot, and we were coming up with 4 different “visions” of how we as UX people could see our role in an agile development process. 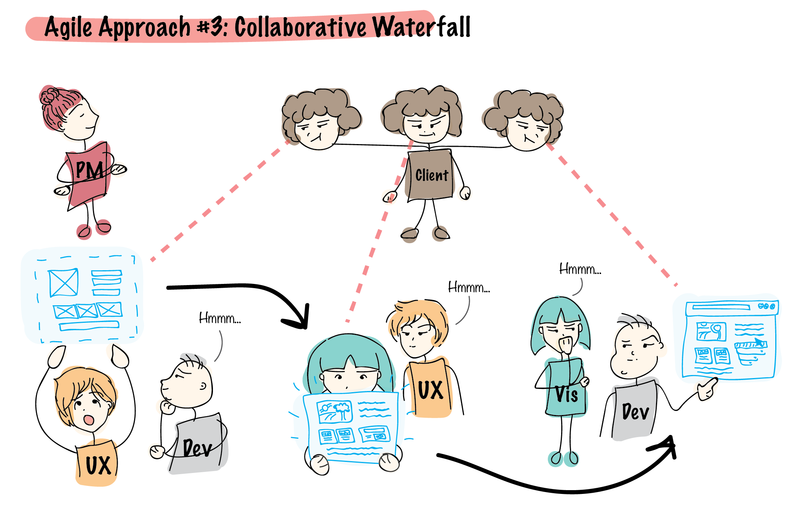 That approach is something that I witnessed a lot: we are talking about agile – but it’s not really a big change to a waterfall method other than splitting a bigger goal into different sections – and keep passing them on from one silo to the other. The work is done in small slices with quick turnaround so that the client has a quick access to what could potentially turn into the final product. It doesn’t foster collaboration very well. There is a risk of not seeing the bigger picture. Conclusion: This version of an “agile process” is more or less a fake and doesn’t change we work together in a team that much. Another approach could focus on reducing deliverables. 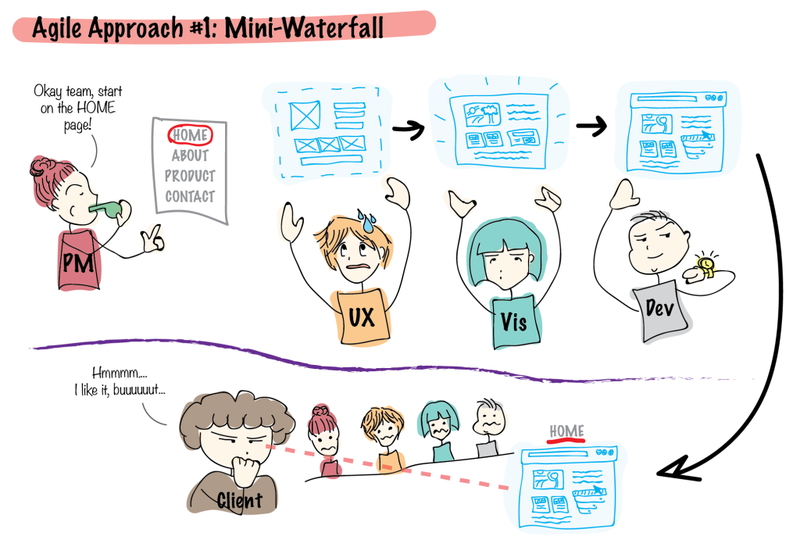 Instead of focusing on creating detailed wireframes the UX Designer observes, listens and verbalizes concepts with the visual designer and the developer. Time is not invested in detailed wireframes. Working on “the real thing” starts sooner. 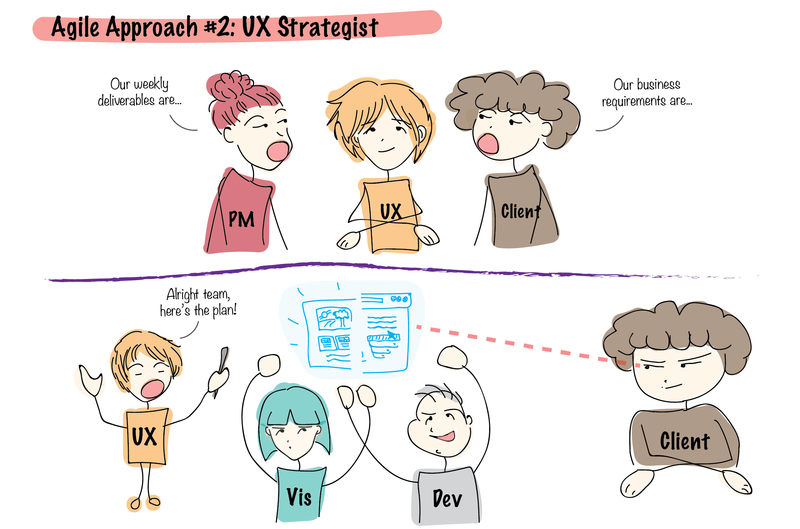 This version would change the role of an UX Designer and would ask for different or additional skillsets: a UX Designer becomes more of a strategist and lead person, focuses on the big picture but not on details and micro-interactions. This is the version that I hear people talk about often. It’s the paradise version, the dreamland, the “let’s do it all together”: People with different skills and knowledge would come together, brainstorm, sketch out, ideate and iterate together. The product is being creating based on a team effort with people sitting next to each other to communicate easily. Deliverables are reduced to the minimum, developing starts right away. Needs lots of resources – inefficiency? 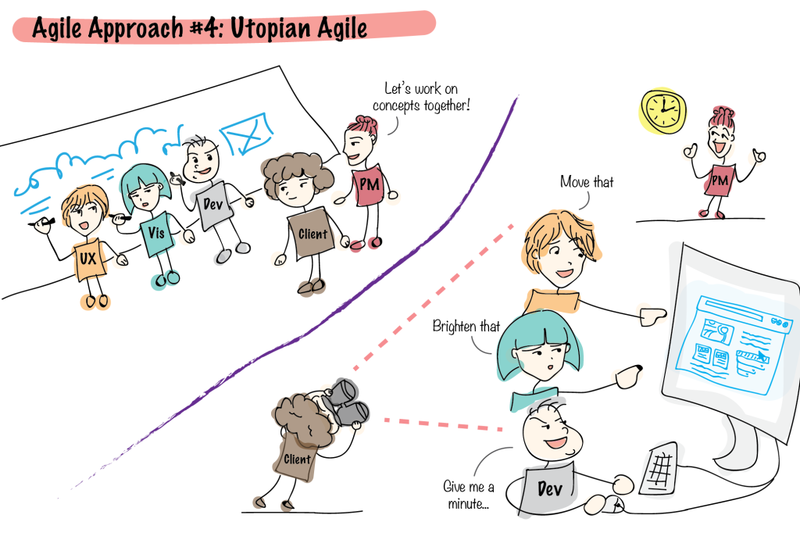 Conclusion: Is this what the ideal version of agile should look like? Is this even feasable? The last approach is my currently preferred working style. It follows the traditional approach – but uses the “agile attitude” with a very collaborative mindset. A UX Designer still does wireframes – but instead of figuring everything out amongst their UX tribes they talk to a developer and designer to make sure, ideas are feasible. Conclusion: This approach is a version of having a collaborative work environment while letting people still focusing on their specific skill sets. I am curious to experience different “agile” work environment to get a better idea of how it affects my work as a UX designer – but for now to me agile is mostly about the attitude than about a method or a process.